This is the Overland Limited HO Scale Electric Train Set from Bachmann. 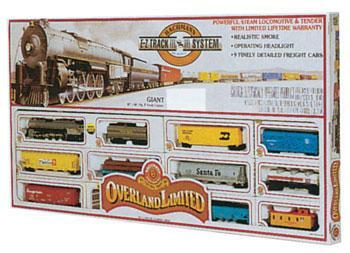 This Set Features a Steam Locomotive and Tender with Nine Detailed Cars. Includes the E-Z track system. Retail $419.00 SAVE 37% ! This is a great value! The only problem is that the newer version of this set came with a slightly different locomotive, other than that, I love the set, and I&apos;m sure that you will like it, too. gray, black, and silver with yellow print. "JONATHAT BARNWELL GRANTS PASS OREGON"
I&apos;ve had this set before. I am now running this one on 33.25 radius curve track . I find the locomotive looks better on the larger radius.